If you’ve ever worked in close quarters in any office environment—whether it’s a cubicle or open space—you may have experienced the annoying secondhand smells and noises from someone’s lunch or snack that take your focus off your work. It can be quite overpowering and distracting when someone’s food stinks or makes sounds. Even if you haven’t had the experience of someone’s annoying food habits, make sure you don’t become that person who has everyone rolling their eyes every time you reach for your lunch tote. You don’t want to risk your business relationship with someone over bad food choices. If in doubt about a specific food, leave it at home and opt for something you're sure won't offend others. It’s best to eat in a designated break room, the office kitchen, or the cafeteria if it’s available. If you need to store something in the office refrigerator, make sure you label it with your name and the date you brought it. Don’t leave it in there for weeks … or even days. If you wind up going out for lunch unexpectedly, take your food home at the end of the day so others won't be faced with old or rancid food in the office refrigerator. You may be slammed with so much work that you don’t think you can leave your desk long enough to eat. If this happens, make sure that whatever you nibble on is the least offensive thing you can find. Doing otherwise may cause a problem for your coworkers and have them walking a wide berth around your area. Personal space applies to more than just hovering under someone’s elbow. It also involves smells and sounds. 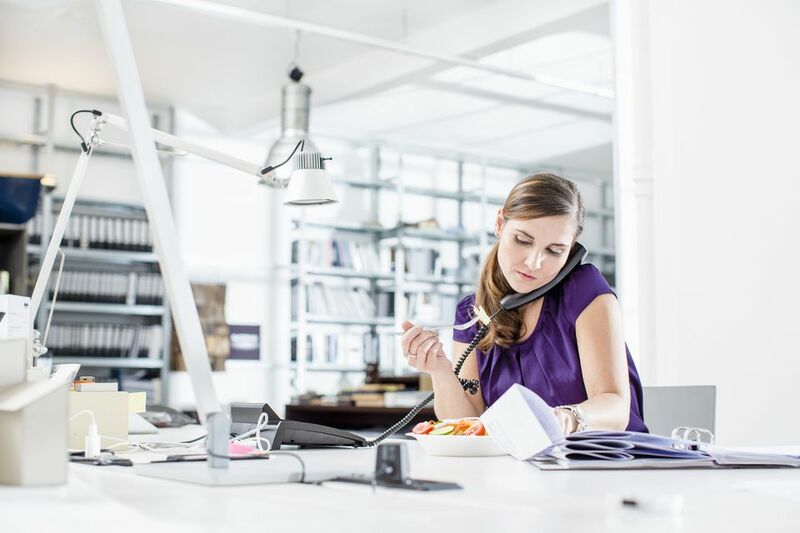 Whether you’re the person who keeps a stash of snacks at your desk, or you can’t break away for lunch, you need to be aware of what is or isn’t acceptable to eat while working. Yes, it does limit you, but that’s better than creating a hostile or less than comfortable environment. Fish—No matter how delicious the salmon is, the smell is enough to make even fish lovers gag. Whether it’s coming from the wafting odors from the microwave or the cold fish from last night’s dinner, don’t expect your officemates to tolerate the strong fishy smells. Cooked broccoli—Yes, broccoli is good for you; no one is arguing that point. It contains antioxidants and other wonderful elements that can keep you healthy for a long time. However, cooked broccoli leaves a stench that can make your coworkers’ lips curl with disgust. Cabbage—Have you ever walked into a house where cabbage was cooking? If so, you don’t need an explanation. Even though it’s delicious with corned beef, it stinks, so don’t bring it to the office. Fermented foods—Sauerkraut and kimchi provide plenty of probiotics, keeping your system running just right. However, anything fermented sends out an odor that will have the person in the next cubicle running for cover. Eggs—Boiled eggs give you lots of protein … and a lot of stink that lingers long after it disappears. Eat your eggs for breakfast and bring something else to work that doesn’t leave an odor. Fast food—Your favorite burgers sure do taste good while you’re eating them, but the smell that lingers … well, that’s a whole different story. Whether you drop your burger wrappers in the waste bin beside your desk or carry them to the big trash can in the office kitchen, fast food will stink up the office for days. Onions and garlic—No matter how you like your dishes seasoned, leave onions and garlic off anything you plan to eat in the office. Not only will it make your office smell bad, your breath won’t be fit for an afternoon meeting. Stinky cheese—When you bring a sandwich or salad to work, and you want cheese, choose cheddar or provolone to keep from smelling up the office. Leave the limburger and other stinky cheeses at home. Smelly spices—Your favorite food might be anything seasoned with curry or chili powder, but those are the foods that will have your coworkers’ nostrils burning. Even people who enjoy the taste of spicy food don’t particularly enjoy having to smell it all afternoon at the office. Peanut butter—Someone in your office may have a severe peanut allergy, and even a hint of it can send them into shock or cause them to stop breathing. Before you bring any peanut products to work, make sure you won’t cause a health problem. Not everyone is as considerate as you are when it comes to their dining habits at the office. If someone eats something that offends or distracts you, let them know in the nicest, most polite way possible. “It sure is hot today, but I need to open the window to let some of the food smells out.” If the office windows don’t open, find a desk fan and turn it on. Some people will take the hint, but others will need to be told in a more direct manner. If that doesn’t work, you may have to take the issue to your supervisor or HR.